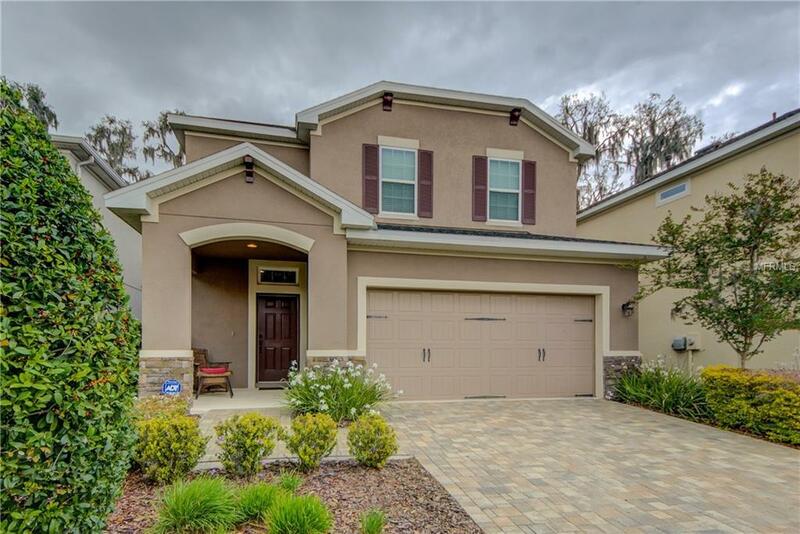 THIS BEAUTIFUL DAVID WEEKLEY "SEAGULL" FLOOR PLAN IS LOCATED IN THE DESIRABLE GATED COMMUNITY OF BAYBERRY GLEN VILLAGE WHICH IS A SMALL ENCLAVE OF QUALITY HOMES WITHIN FISHHAWK RANCH. FANTASTIC 5 BEDROOM, 2.5 BATH PLUS BONUS ROOM.... VERY OPEN GREAT ROOM FLOOR PLAN WITH DINING AREA AND STUNNING DESIGNER EAT-IN KITCHEN WITH GRANITE, WOOD CABINETS WITH CROWN MOLDING, LARGE ISLAND BREAKFAST BAR, STAINLESS STEEL APPLIANCES AND CLOSET PANTRY. THE ENTIRE FIRST FLOOR HAS NEUTRAL CERAMIC TILE THAT HAS A TRAVERTINE LOOK. STUDY/DEN/5TH BEDROOM IS DOWNSTAIRS AND HAS DOUBLE FRENCH DOORS. ALL OTHER BEDROOMS AND BONUS ROOM ARE UPSTAIRS. SUPER COVERED/SCREENED LANAI OVERLOOKS LUSHLY LANDSCAPED BACKYARD. NICELY PAVERED DRIVEWAY, CROWN MOLDING, CEILING FANS, TRAY CEILINGS AND SO MUCH MORE. LUXURY MASTER SUITE WITH, GARDEN BATH, DUAL SINKS AND SEPERATE SHOWER. FISHHAWK RANCH OFFERS NUMEROUS AMENITIES, INCLUDING A FABULOUS AQUATIC CENTER WITH 2 POOLS, 5 MORE ADDITIONAL RESORT STYLE/POOLS, SPLASH PADS AND TOP "A" RATED SCHOOLS!! BROWSE QUAINT PARK SQUARE SHOPS AND EATERIES. ENJOY MILES OF WALKING/BIKING TRAILS, SKATE PARK, FITNESS CENTER, TENNIS COURTS, DOG PARKS AND NUMEROUS SPECIAL EVENTS HAPPENING THROUGHOUT THE YEAR. PERFECT FOR ANY FAMILY LARGE OR SMALL!. Additional Lease Restrictions See Hoa Deed Restrictions. Pet Restrictions Domestic Pets Only.